February 19, 2018 | Purdue News Service - The spotlight is on man’s best friend as the start of the Lunar New Year marks the Year of the Dog. Our furry friends don’t ask for much. Some food, shelter, a little outside time and some friendly pets on the head can be enough to make them happy. Read the full story. February 12, 2018 | WLFI.com - The Purdue Veterinary Teaching Hospital is ranked highest in a recent research survey. The survey was conducted by CalPro who surveyed 26 different university vet hospitals across the country. Read the full story. February 9, 2018 | The Purdue University College of Veterinary Medicine and the Veterinary Technology Committee welcomed current high school senior interviewees and guests for the on-campus Veterinary Technology Program on Saturday, January 28. - The Purdue University College of Veterinary Medicine and the Veterinary Technology Committee welcomed current high school senior interviewees and guests for the on-campus Veterinary Technology Program on Saturday, January 28. Read the full story. 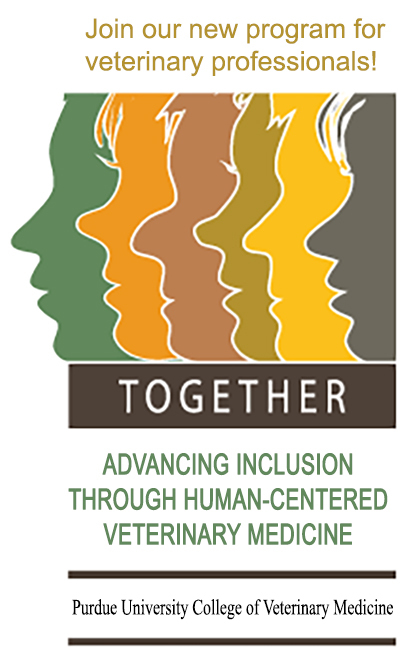 February 9, 2018 | Purdue University’s Center of Excellence for Diversity and Inclusion in Veterinary Medicine is partnering with the online educational resource VetVine® to help practices to show that they are committed to an inclusive environment, both for professionals and clients. - Purdue University’s Center of Excellence for Diversity and Inclusion in Veterinary Medicine is partnering with the online educational resource VetVine® to help practices to show that they are committed to an inclusive environment, both for professionals and clients. Read the full story. November 16, 2017 | Purdue Today - Dr. Timm Gudehus has been around horses his entire life. He showed them at an early age, rode semiprofessionally and prepped them for sale. It was only natural for him to pursue a career as a veterinarian whose specialty is equine surgery. Read the full story. November 10, 2017 | Inside Indiana Business - The Purdue University College of Veterinary Medicine has announced a nationwide expansion of its after-school science program. The program, known as This is How We "Role," targets elementary school students and seeks to diversify the veterinarian scientist workforce. Read the full story. September 28, 2017 | Inside Indiana Business - Plans are underway to build a $35 million equine hospital at Purdue University’s College of Veterinary Medicine. 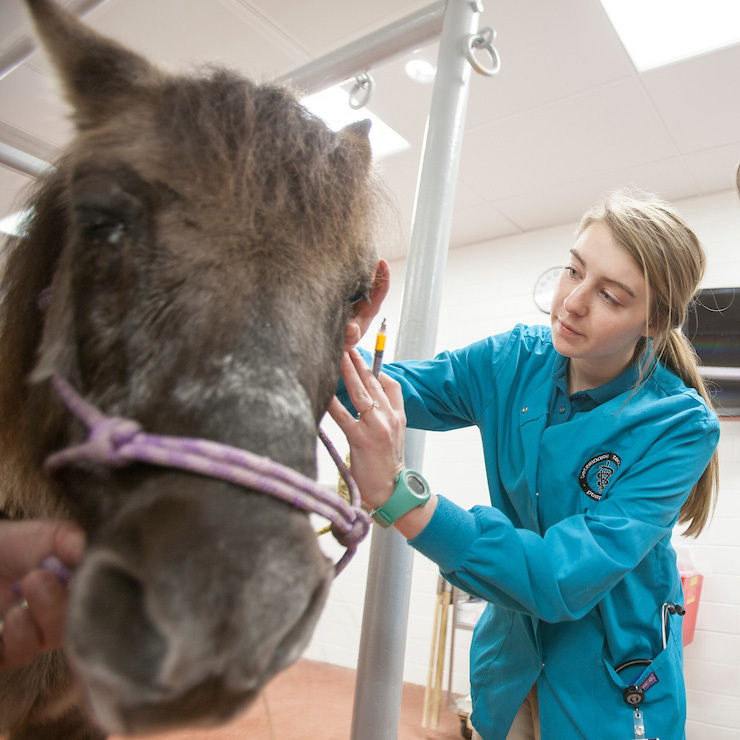 School leaders say horses are currently crowded into the existing Large Animal Hospital where they share space with food animals, increasing the risk of disease transmission and over-extending a facility built nearly 60 years ago. Read the full story. August 11, 2017 | Purdue University - When 'Chalee’s Dream Jet,' just Jet for short, was born without complication at the Purdue University Large Animal Hospital, everyone involved breathed a sigh of relief, if only for a minute. As time passed, it was apparent that Jet was having trouble standing and walking. Read the full story. August 10, 2017 | Time Magazine - Purdue is especially well known for its engineering and agriculture programs. Recent graduates report average salaries to PayScale that are 20% higher than colleges with similar demographics, according to MONEY's calculations. Full profile. Read the full story. August 6, 2017 | Indiana Business Journal - ibj.com - Purdue University is working on plans for a $35 million hospital where horses would be treated. The proposed project for the West Lafayette campus will include space for large-animal surgery; radiology, examination and diagnostic equipment; a reproductive systems ward; and an intensive care unit. Read the full story.